I sometimes feel self-conscious when I go out with R because of the spectacle that we can become. 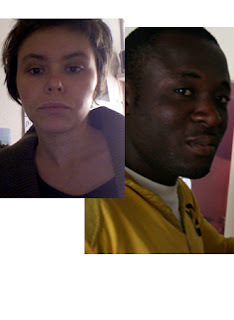 He is Ghanaian, and I am American. We are both foreigners here, and even on our own we command second glances. Together, however, it isn’t just glances that we receive, but full-blown stares. Usually as we walk, we are so busy talking that I don’t notice the waves that we are creating. It is not always unfriendly looks that we receive, but more often those of curiosity. Who are those two? What exactly is their relationship? People search each of our faces in turn, and then direct their eyes towards the way that our bodies relate in an effort to decipher the coded language that we are inevitably sending out. I try to look away before I see how they make up their minds. The question that people are asking with their looks is not about us as individuals, but about us together, as a pair. R says that it isn’t as bad now as it used to be. He says that four or five years ago, everyone would stare. Now it is only three out of five people. He tells me not to mind what anyone is doing or thinking because it doesn’t affect us, but I can’t always muster his easy confidence. I am not used to having a relationship publicly examined for its sexual content. As a young woman in Greece, I have grown used to the wondering eyes and catcalls of men, and alone I am able to discount them. I have even learned to confront those who cross the blurry line of acceptability. However, it feels completely different when I am walking with R and we get the once, twice, three times over. It is not the same direct advances that I receive on my own, but rather silent questioning stares that follow us as we go, and which feel much more invasive. Outside, I become defensive of our friendship because it feels exposed and tender. We often laugh at the commotion that we create (for example, last night, when a man did a double take on his motorbike, then stopped short to watch us pass, shook his head, and kept going), but it is a bitter laugh, and one that I wish that we didn’t feel obliged to make. What is the most painful for me is the fact that outside of either of our houses, our relationship can feel like a stage production based more on who we are not (them) then who we are (two young people trying to figure their way through a confusing foreign system). Of course, I hate the fact that people stare, I hate feeling naked and judged, but these are feelings that right or wrong, one has to learn to swallow. It saddens me beyond what I can describe to know that this is the improved version of what R’s life used to be, and some of the stories that he has told about dating Greek women made me cringe. As painful as it can be, or can threaten to be, this is a subject that we have been talking about a lot. Who we are as individuals, who we want to become, and how people in this culture and in our respective homes regard us. R is absolutely right when he says that it is not important what strangers passing on the street may or may not think about us, but it is a lesson that, no matter how I try, is difficult to remember. Interesting blog as for me. I'd like to read a bit more concerning that matter.